Comment deadline extended to Mon., Feb 25, 2019, 5:00pm. A vineyard development at the southern edge of Angwin has been making its way through the county meat grinder for a couple of years now. The Le Colline Vineyard ECP and DEIR calls for the clearing of a wooded hillside with a flat topped knob (Le Colline) just south of Angwin. 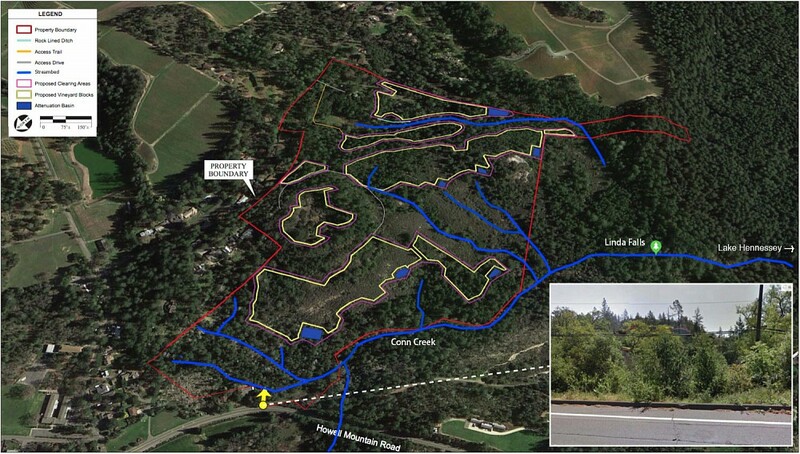 (map) The vineyard will consume much of a watershed that adds to the popular natural attraction of the Linda Falls Preserve before heading down Conn Creek to Hennessey Reservoir and the taps of Napa city residents. It will also consume a fair number of trees that will be cleared in a timber harvesting operation. This was one of the projects that convinced CalFire to turn over control of Timber Harvest Plans to the County in 2017 (see here). Access to the vineyard will be off the dead-end Cold Springs Road, a community already concerned over the threat of the Aloft Winery proposed at the end of the road. A Draft Environmental Impact Report has been prepared for the project and public comments have been requested on the DEIR. The deadline for public comments is Mon, February 25, 2019, 5:00pm. SRC 3/9/17: Deforestation leader: CalFire or County?